The de Broglie was a part of the French aristocracy as far back as the reign of Louis XIV. In fact, one of Prince Louis' ancestors was guillotined during the French Revolution. Thus, when Louis de Broglie was born in Dieppe on August 15, 1892, a scientific career did not appear to be his most likely future. 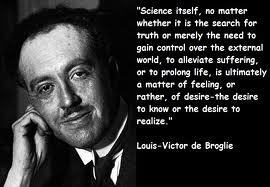 Indeed, de Broglie began studying history at the Sorbonne in Paris in 1909. His interest in science developed later, partly as a result of his brother Maurice's influence. Maurice, who operated his own private center for x-ray research, apparently stirred an interest in young Louis, and Louis enrolled at the Faculté des Sciences in Paris. There, he received his Licencié ès sciences there in 1913 and, later, his Docteur ès sciences in 1924. De Broglie's conversion to science came at a critical point in the history of physics. Scientists were intrigued with the notion that matter and energy were much more closely associated than had once been imagined. As early as 1905, Albert Einstein showed that mass and energy are interconvertible (E = mc2). Furthermore, in his analysis of the photoelectric effect, Einstein also proved that energy (light) can be understood in terms of particles (quanta of light). In the early 1920s, Arthur Holly Compton took this analysis one step further. Compton showed that the scattering of x-rays could best be described if one assumes that the x-rays consist of discrete particles, to which he gave the name photon. It had become apparent that the terminology of matter (particles) could be used to describe the nature of energy (waves). De Broglie realized that this dualistic approach could also be applicable to particles. That is, if waves can have the properties of particles, then perhaps particles can have wave properties. Using relatively simple mathematical analysis, de Broglie showed that the wavelength of a particle moving through space can be represented by the equation &lgr; = /mv, where is Planck's constant and mv is the momentum (mass multiplied by velocity) of the particle. For particles of macroscopic size (a tennis ball, for example), the quantity mv is so large that &lgr; is far too small ever to be detected. But for small particles, such as an electron, &lgr; should be observable. For example, an electron traveling with a velocity of 100 cm/sec would have a wavelength of 0.07 cm. De Broglie's theory, first presented in 1923, was confirmed within a short time. In 1927, Sir George Paget Thomson (1892-1975) and Clinton Davisson obtained independent confirmation that electrons have wave properties. Furthermore, they both found that the wavelengths of diffracted electrons correspond to those predicted by the de Broglie equation. For his work on matter waves, de Broglie received the 1929 Nobel Prize in physics. De Broglie served as professor of theoretical physics at the University of Paris from 1932 to 1962. He died in Paris on March 19, 1987.